Last week I introduced the precious gift that my cousin Sue shared with me—her grandfather Milton Goldsmith’s family album. Today I will share the second and third pages in that album. 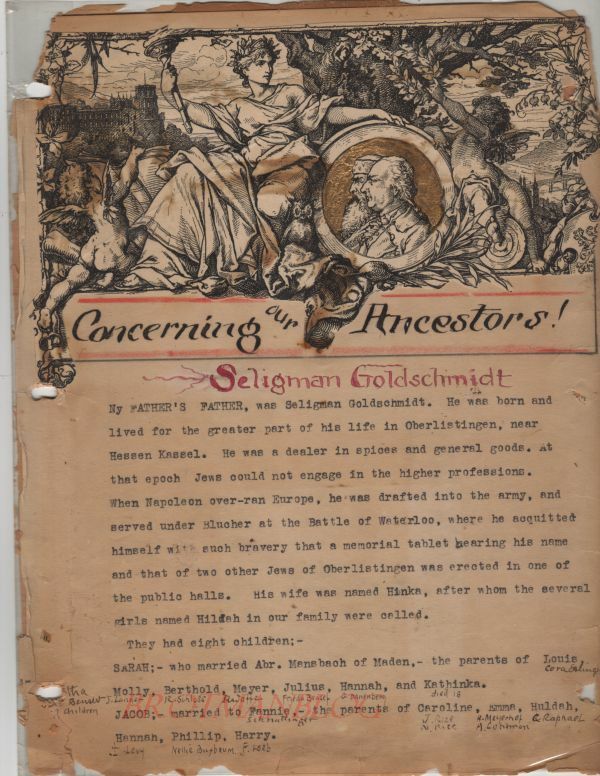 My father’s father, was Seligman Goldschmidt. He was born and lived for the greater part of his life in Oberlistingen, near Hessen Kassel. He was a dealer in spices and general goods. At that epoch Jews could not engage in the higher professions. When Napoleon over-ran Europe, he was drafted into the army, and served under Blucher at the Battle of Waterloo, where he acquitted himself with such bravery that a memorial tablet bearing his name and that of two other Jews of Oberlistingen was erected in one of the public halls. His wife was named Hinka, after whom the several girls named Hildah in our family were called. How wonderful to learn about Seligmann’s occupation and his brave service in the Battle of Waterloo, facts that were not revealed in any records I’d found. As I noted last time, I found this report reassuring in part because it backed up the research I had done on Seligmann and Hinka and their children. Our father, Abraham, came to America at the age of 17 and married at the age of 24. He was a very clever, well educated man, with a thorough knowledge of both German and English, and an omiverous reader of good books. He was successful as a merchant, but failed whenever he undertook any venture outside of his legitimate business. He was at the head of many civic organizations, and highly esteemed by a great circle of friends. In 1878, in consequence of a depression, he retired from the cloth business, and was worth a quarter of a million dollars. Most of this was eventually lost. His declining years were very unhappy, and he lingered for 12 years with an incurable malady. He died at the age of 72. My blog posts about Abraham mention his business successes and failures, the stroke in 1890 that left him disabled for the last twelve years of his life, and his impressive library of books. But having his son Milton’s affectionate and admiring words adds another layer to the story of this man, my 3x-great-uncle. 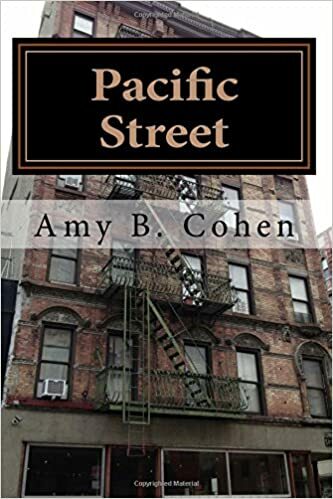 BETTY: married to Jacob Goldschmidt, (a cousin,) with several children, all of whom except Hettie Steele lived in Germany. Who was Hettie Steele? She was not on my family tree. This little sentence led me to a very fruitful and uplifting search. I will save that for my next post about Milton’s album. 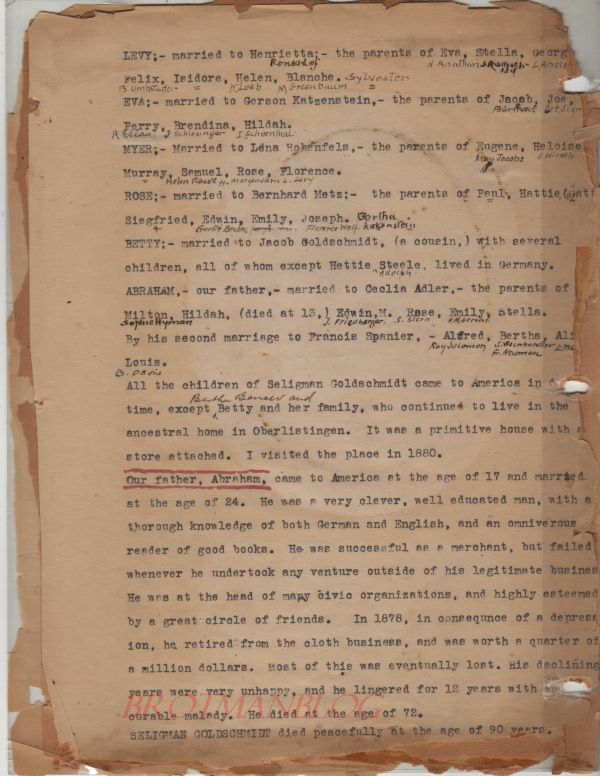 This entry was posted in Genealogy, Goldschmidt/Goldsmith, Milton Goldsmith's Family Album and tagged Goldschmidt, Goldsmith, Milton Goldsmith by Amy. Bookmark the permalink. You are very good at giving us cliffhangers! LOL! I don’t mean to torment people. I just don’t want to make the posts so long that people stop reading! Thank you, Peter. Seeing that name did pique my interest—especially since I didn’t think Betty Goldschmidt had any living descendants. So, as you will see, the search was very gratifying. Hi Amy, a heartfelt tribute from Milton about his father. So sad Abraham’s depressive period lasted as long because he clearly was an astute businessman and bi-lingual too. I look forward to reading your findings about Hettie Steele. Hettie was my grandmother’s name and not so unusual for early 20th century here in the UK. I am not sure whether the word depression in Milton’s essay referred to his father’s mental state or the economy. I tend to think the latter?? Thanks, Shirley! Love the looks of old, very fragile, documents that contain precious family information. Take good care of it (although I’m sure you’ve already digitized it). Also, I can’t wait to read about Hettie Steele. There’s always another branch to investigate. Such fun! The actual book is in the possession of my cousin Sue; she is scanning it for me. I have suggested that she place it in an acid-free container to preserve it. Thanks for your thoughts! I love how this is evolving. You are very blessed to have the album being shared with you and the time for further research. Thanks, Emily. I do feel very blessed. This album is a goldmine, a treasure beyond measure. Have you made any progress in identifying the artist of the illustrations? This is such a wonderful gift that your cousin has shared with you. A quarter of a million dollars was A LOT in those days – heck, it’s a lot in these days, too. It sure is! But back then—WOW! Wow! Seligmann, your third great-grandfather, fought against Napoleon at the Battle of Waterloo?! That sounds like a fascinating story to dig into. I’m curious what records from the battle survive. I don’t know. It’s certainly a question worth pursuing. Really lovely. Looking forward to reading about Hettie Steele!